A1 Rockwalls was established in 1998. The story of the business is this. 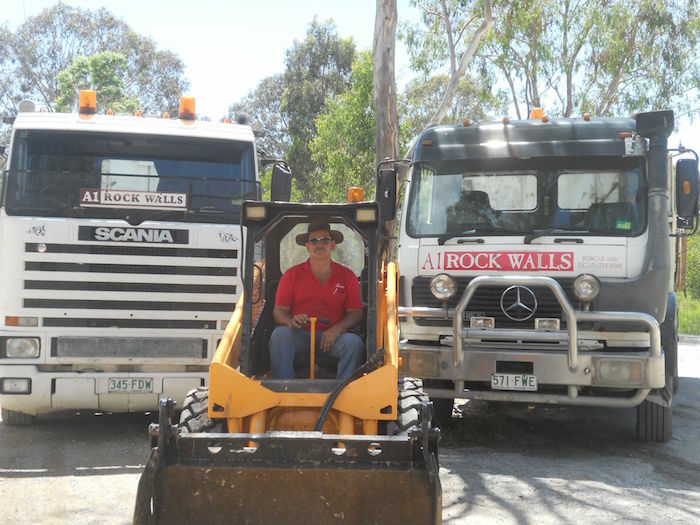 In 1985 I started working in the concrete and transport industry in Central Queensland and moved to Brisbane in 1988. After working with earth moving and demolition companies we bought our first excavator in 1990 and opportunities grew from there. 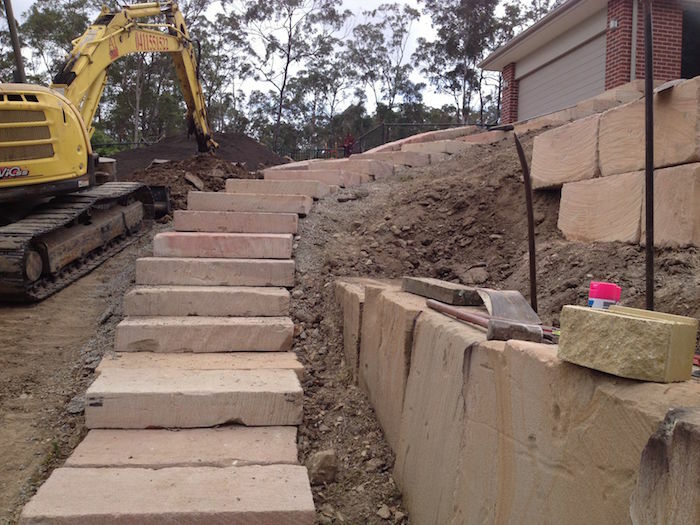 After years of experience in the construction/earthmoving industry, I (owner/operator Clive Brosnan) and obtained my Contractor License (Licence No 1086952) which qualifies me to be a builder restricted to structural landscaping. 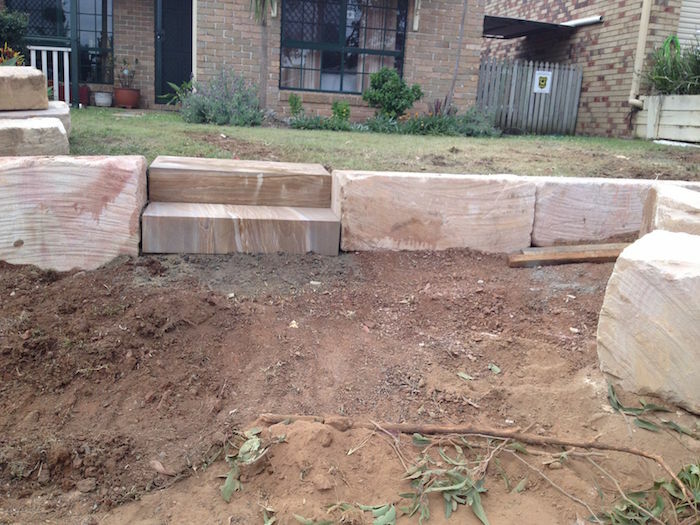 I have Certificate III in Landscape Construction and I have Certificate IV in Building and Construction. I currently hold a Skid Steer Loader Ticket, Excavator and Roller Ticket, Bulldozer, and a Backhoe and Forklift High Risk Ticket. I have assisted various staff in acquiring their earthmoving and HR (Heavy Rigid) truck licences. I aid in the training of the use of machinery for the business. I hold a Blue Card from the Work Health and Safety Dept. This is just a small sample of our work. If you have a specific job in mind, we can give you some ideas about how it might be done. We’re used to being flexible and working with a variety of challenging conditions. 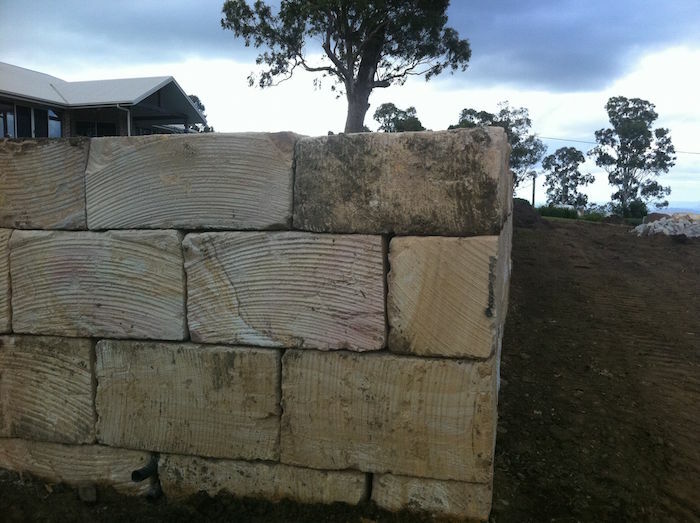 I recently contracted Clive Brosnan of A1 Rockwalls to erect a sandstone wall on the boundary of my property at Kallangur. 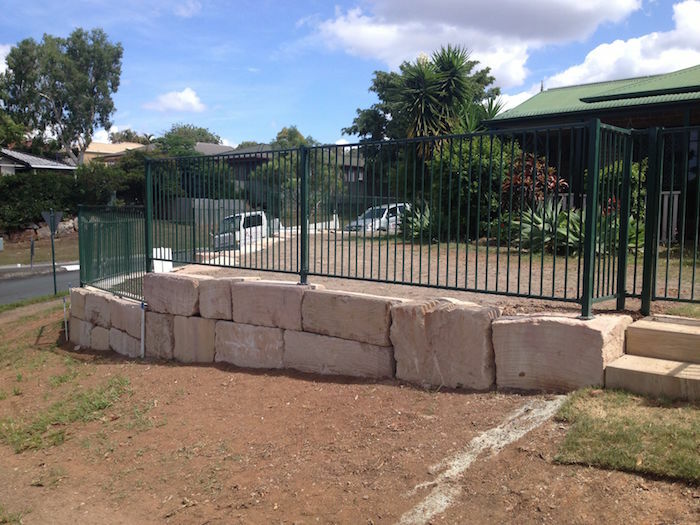 In addition to the boundary wall, which splits off and runs to the high side of the slope, I also had a pool fence erected on top of the sandstone wall and a colourbond fence, with remote control gate, also installed. (See fence pictures above). 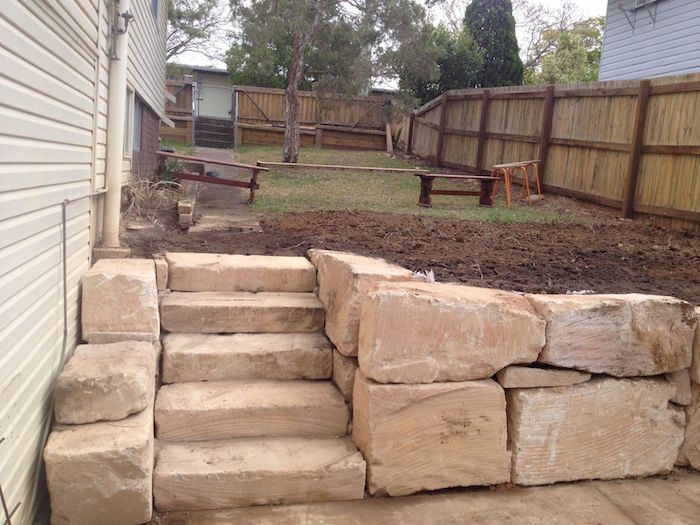 My property is on a sloping block and when I first contacted Clive I was unsure of what I actually needed but as Clive was completely professional and patient in his dealings with me I came to realise what the outcome could be. 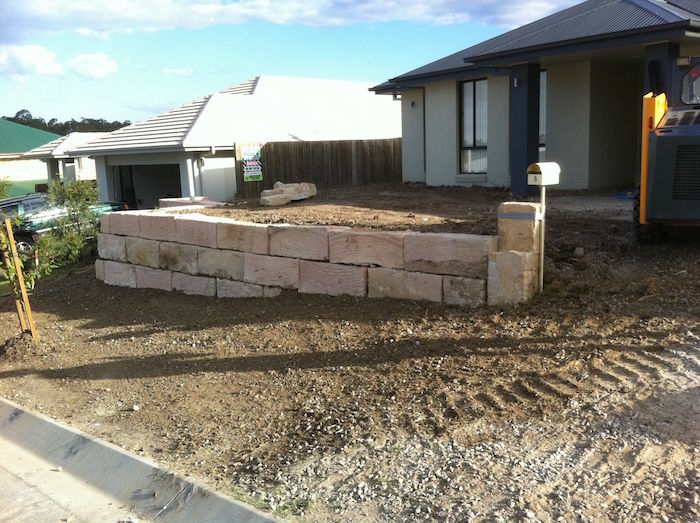 Clive surveyed the area, explained my options and presented me with a quote for the work. 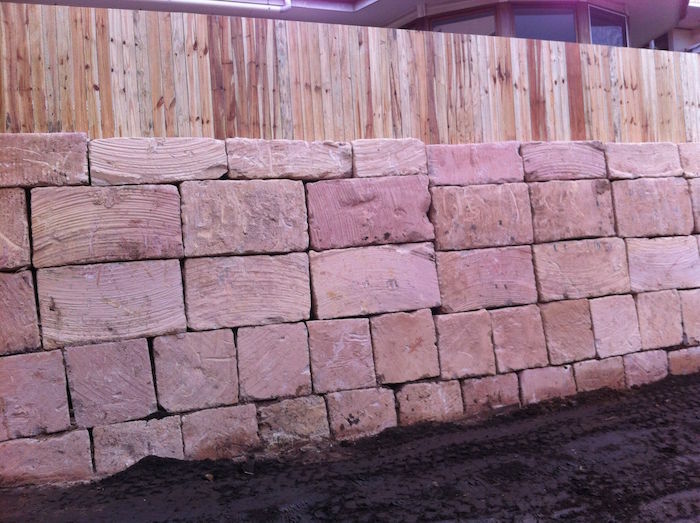 He arrived, as promised, with Richard Kirwan and both men had the sandstone wall in place within a matter of days. Clive and Richard’s work was exceptional. They were quick, neat and the whole area looked great. The wall was up and the yard was as neat as a pin with all rubbish removed. They then took down the old timber fence and gate and replaced it with a colourbond fence and remote controlled solar powered gate. I believe Richard laid the concrete and erected the fence and installed the gate. Once again, it was a perfect job. 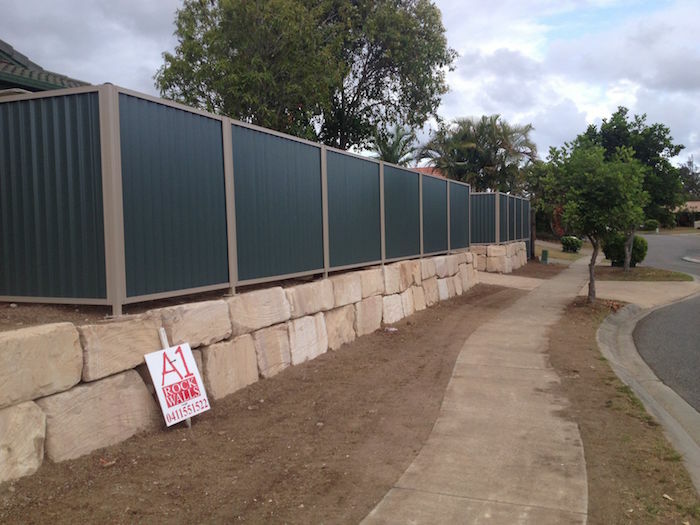 Over the sandstone wall a powder-coated pool fence and two gates were installed. Clive and Richard did a wonderful job with this fence. I would have no hesitation in recommending both Clive and Richard. Their work ethic, attention to detail, and professionalism have resulted in the finished product being absolutely perfect and exceeding all my expectations. 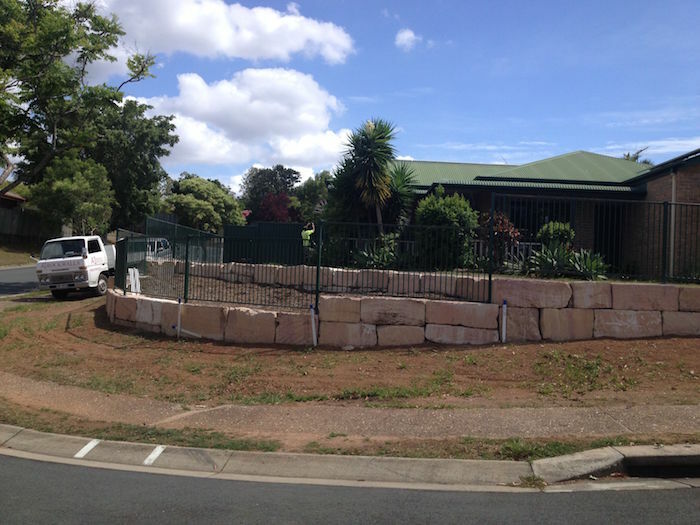 Thank you both so much for landscaping our front yard and building our sandstone rock wall. 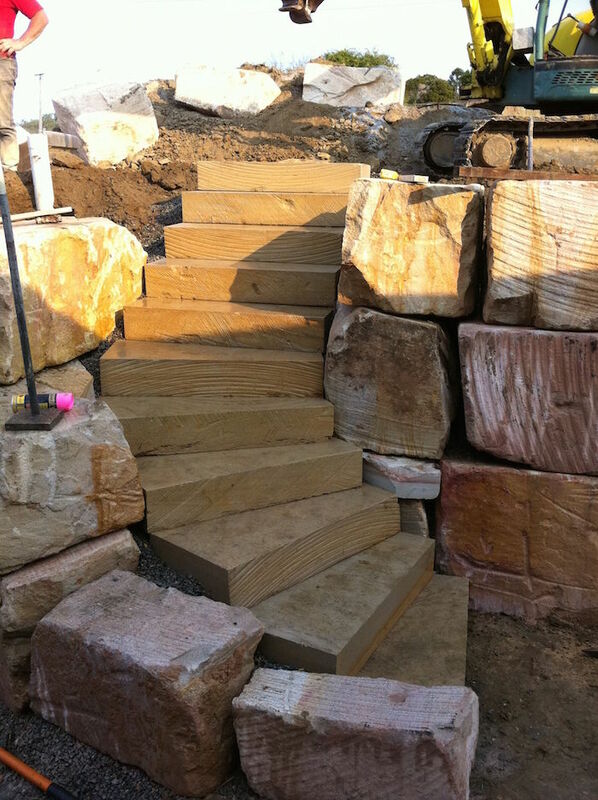 We were impressed by the fast service, the obvious care in selecting just the right stones for the job, the cut-in steps and for the custom built sandstone mailbox incorporated into the design. 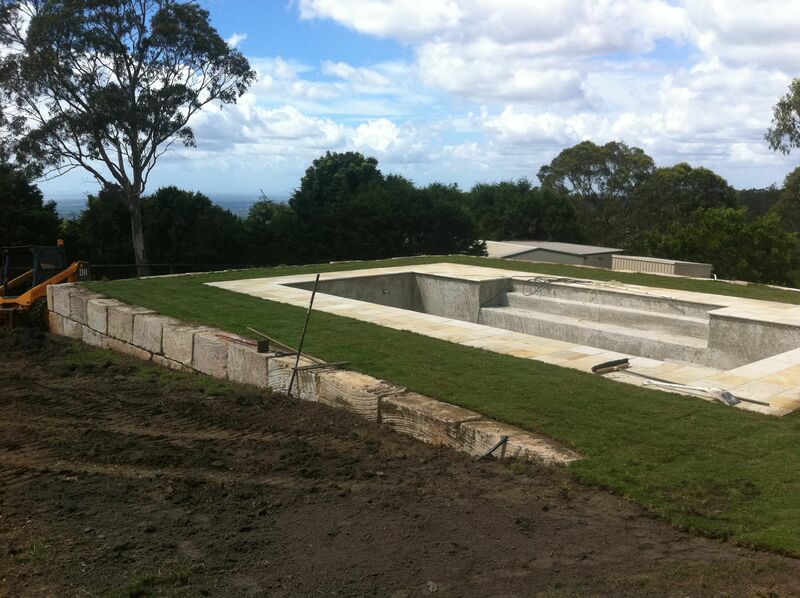 It is exactly what we wanted and it has added a lot of value to our property. Your professional work is often noticed and admired by our visitors. Thank you both for your excellent work. 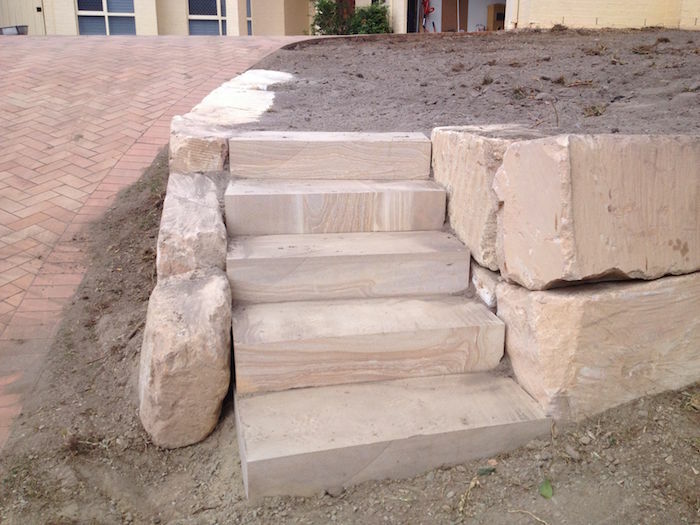 We recommend you to everyone who is considering a project made of sandstone and would ask for your assistance with future projects of our own in a heartbeat. 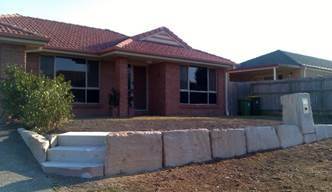 You can see more rockwalls we have built on our facebook page. 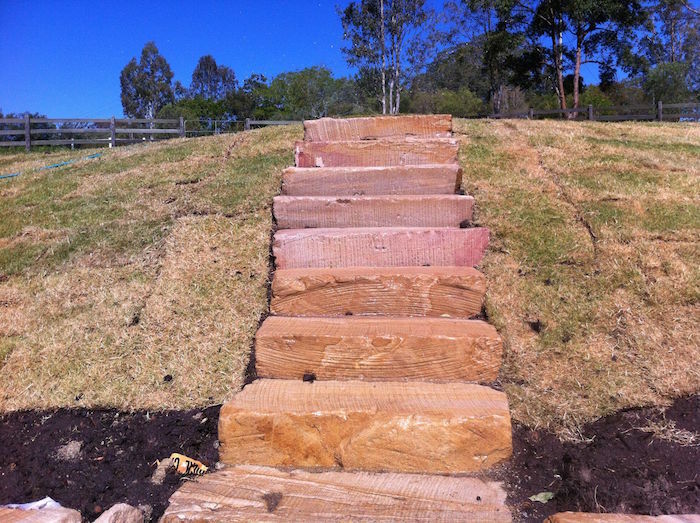 We would love it if you added more pictures from some of the work that we've done for you.